The MetKor Group Inc. specializes in fabric covered building sales and recovers, as well as all aspects of the general contracting industry. MetKor is an authorized Calhoun Super Structures dealer. CMG & Calhoun Super Structures Sponsoring Bus to the Can Intl Farm Show in TO! Good News! CMG is partnering with Calhoun Super Structures to sponsor a coach bus to the Canadian International Farm Show on Wednesday, February 08, 2012 - $10 per person gets you to the show and back, and covers your admission for the day. The bus will leave the parking lot of the North Huron Wescast Community Complex, 99 Kerr Drive, Wingham, at 7:00am, and making a second pick-up at the parking lot of the Canadian Tire Store parking lot in Listowel, 500 Mitchell Road, at 7:30am, then arriving at the show between 9:30am and 10:00am. Space is limited, so contact us today to book your spot - 1.855.264.2969! 2011-09-22: FREE Building Draw Winner Picked! 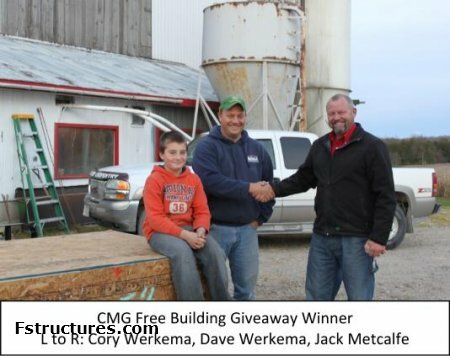 Congratulations to Dave Werkema, of North Huron Carpentry Services, the winner of our FREE Building Draw! Dave's name was pulled from over 600 entry ballots. Dave has won a 12' x 20' fabric covered building with 2 ends. Thanks to Dave and everyone else who participated in our draw! 2011-08-16: CMG Building Solutions partnering with Calhoun Super Structures! Good news! CMG is now an authorized Calhoun Super Structures dealer - http://www.calhoun.ca/ - we're looking forward to working with the Calhoun team and contining to serve your fabric covered building needs! There’s good news in the fabric covered building industry in Huron and Bruce Counties. CMG Building Solutions Inc. is now an authorized dealer for Calhoun Super Structures. For fabric building owners who need maintenance or repairs done on their building, or those who are considering purchasing a new building, this partnership represents the very best in customer service and on-going maintenance and support. Located near Wingham, Ontario, CMG evolved from a need in the fabric building industry for service, cover replacement and building permit applications. The initial focus was on a niche market assisting clients with applying and obtaining municipal building permits throughout the province. With the number of fabric covered buildings in Ontario exceeding 6000, an obvious extension of CMG Building Solutions Inc. became servicing fabric covered buildings and replacing covers. Calhoun has come a long way from its beginnings as a tarp-cover business on the family beef farm near the agricultural community of Chesley, Ontario. But from the beginning, Calhoun has been committed to making the Super Structure the best it can be by giving their customers the strongest, most reliable product at a price that's competitive with that of the competition. With CMG now offering the fully engineered line of Calhoun Super Structures, the benefit to the local economies of Huron and Bruce include potential job creation and a sharing of local expertise and resources, readily available for any fabric covered building client. 2011-08-08: You can now reach CMG toll free! You can now reach CMG Building Solutions Inc. toll free by calling 1.855.264(CMG).2969. Call us today with your fabric covered building/general contracting inquiries! check it out on You Tube: http://www.youtube.com/watch?v=yYqLjUtZrzU – an open house will be happening soon, so stay tuned! CMG will be attending the Northern Mines and Exploration Expo, happening in Timmins on May 18th and 19th http://www.canadianminingexpo.com/ - we’ll be at the Norseman Structures booth – stop by and see us! Coming soon to a fabric covered building near you: our 2011 road tour continues. Be sure to keep any eye out for our white CMG van as we connect with clients across the province to share info on our products and services. Don’t miss out! Norseman Structures’ spring promotion - a 10% discount on the QL Series (Landmark), 40' and 50' widths – is done at the end of May. Contact us today for more details! CMG Building Solutions is the authorized dealer in Ontario for Norseman Structures – a world leader in the steel framed, fabric covered building industry. During the month of May, Norseman is offering a 10% discount on their QL Series buildings - 40' and 50' widths. To learn more about this promotion, and the types and sizes of Norseman structures available through CMG, visit www.norsemanstructures.com . Norseman Structures, fiercely reliable since 1921. Or alternatively, visit CMG Building Solutions at www.cmgsolutions.ca.